9to5Mac claims that Apple will debut the long-rumored 13" Retina MacBook Pro alongside the iPad Mini later this month. The new 13-inch MacBook Pro will be sold in two configurations, with differing processors and storage, and will be available for purchase soon after introduction. Like with the 15-inch MacBook Pro lines, the 13-inch MacBook Pro with Retina Display will be sold (at a higher price) in addition to the current non-Retina display model. The site typically sources this information from early part numbers, suggesting that two higher priced configurations have already appeared in Apple's systems. The new models line up with analyst Ming-Chi Kuo's predictions of a separate Retina display lineup that will sell alongside the existing MacBook Pro line. 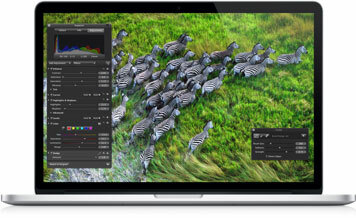 Apple introduced the 15" Retina MacBook Pro in June, but retained the existing 15" MacBook Pro as well. Apple appears to be continuing this pattern by providing two 13" MacBook Pros -- one with a Retina display and one without. The iPad mini event is reportedly scheduled for October 23rd. $1500+ for a 13" underpowered laptop with a nice screen...no thanks. My guess would be a starting price of $1799 or $1899. I think you just described your 13" Air. Underpowered...you have a MacBook Air...wtf? Anyone know when the MacBook Air will be updated for retina display? The retina display will be reserved for the Pro I think. At least in 2012-2013. 3.6lbs, rated 7 hr battery life. Unsure if Apple will stick HDMI in the 13" like they did the 15" (but it would be much appreciated). Price premium of the Retina Display is about $200. And do remember that there is a lot of fudging because when you configure a 15" Classic MBP with the same hardware specs as the 15" Retina MBP, it costs just the same even without the additional cost of the better display. Again, these are just guesses, but they're educated guesses.